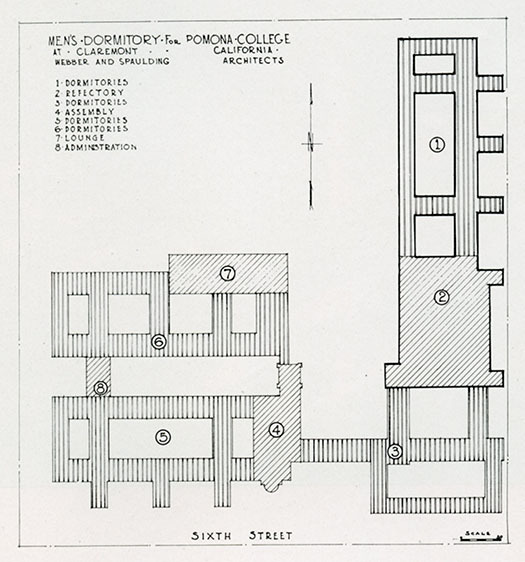 This basic site plan, which appeared in the program of the 1929 building dedication for Clark I and Frary Dining Hall, provides the answer. 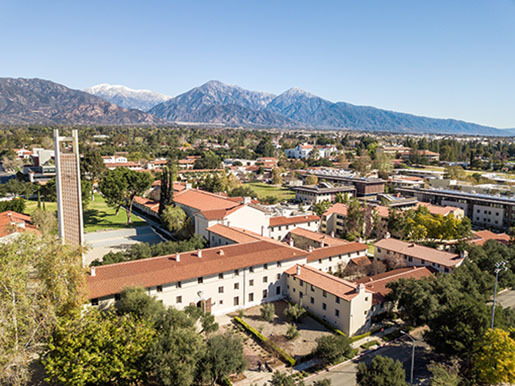 When architect Sumner Spaulding was hired in 1926 to design what was to be known then as the “men’s campus,” his proposal included four dormitories and a refectory, assembly hall, lounge and office—a total of eight buildings. As seen here, each was assigned a number. Only the first two phases of the project were completed, however—Clark I and Frary Dining Hall in fall 1929, and Clark III and Clark V in fall 1930. The numbers appear to have been simply for reference purposes. Over the years, more than a few creative theories have been spun to explain the absence of a Clark II and IV, but, as often happens, the truth is far simpler and more mundane than might have been hoped. The dormitories were named in honor of trustee and donor Eli P. Clark. Frary Hall, gift of trustee George W. Marston, was named for Lucien H. Frary, former pastor of Pilgrim Congregational Church.